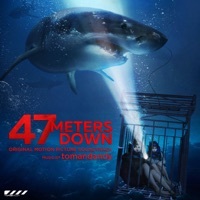 The official soundtrack of 47 Meters Down (AKA In The Deep) contains 32 phenomenal tracks by tomandandy. The film also features music by Axel Mansilla, Los Mejores Mariachis de Mexico, Syn Cole and Richard Hawley. Opening scene where Lisa dives up and scares Kate. Kate invites Lisa to a party where they meet some local men named Javier and Louis. Kate and Lisa are having dinner with Javier and Louis. They talk about cage diving with sharks. The local men takes the sisters on a boat ride to the deep end of the sea to go cage diving. Later, plays entirely during the end credits.